Did CNP Forget to Apply for $1,930,108 MSI Grant? UPDATE (June 10) : The 2014 Accepted Projects numbers are out. We have received less than the allocation for 2014, so it looks like we really did lose $1,930,108 in 2013. I guess the old Council was too busy with their grand schemes to bother about applying, and the new Council was too busy penny-pinching to notice. This should be a major scandal, but they have kept it hushed up long enough that it is now ancient history. As mentioned in MSI Grant for Hospital Demolition, the the list of approved projects shows no capital grants for CNP in 2013 (we should be under "Specialized Municipality", page 4). About 20% of CNP's budget comes from Alberta MSI Grants. Municipalities get a maximum allocation based on a formula. These can be used for "municipal roads, bridges, public transit vehicles/facilities, emergency services facilities/equipment, water and wastewater systems, solid waste management facilities/equipment, regional and community airport facilities/equipment, and other municipal buildings such as recreation and sports facilities, libraries, public works buildings, and cultural and community centres". We have $millions of eligible projects. I don't know whether we can still get the 2013 allocation, or if we have lost $1,930,108 . I think the 2014 grants figures will come out in a couple of months, unless they are delayed because of the budget fiddling. » Once details surrounding the future of the Pass Community Pool and the Albert Stella are further identified, and assuming that one or both of those facilities does not warrant reinvestment and will be decommissioned, a feasibility study for a multipurpose facility should be facilitated. » Utilizing the Facility Condition Index analysis, reinvest in the pool. » Replace the Pass Community Pool in the long-term with an indoor pool development. Reinvest in the existing facility (or alternative options) to sustain existing activity provision service levels. 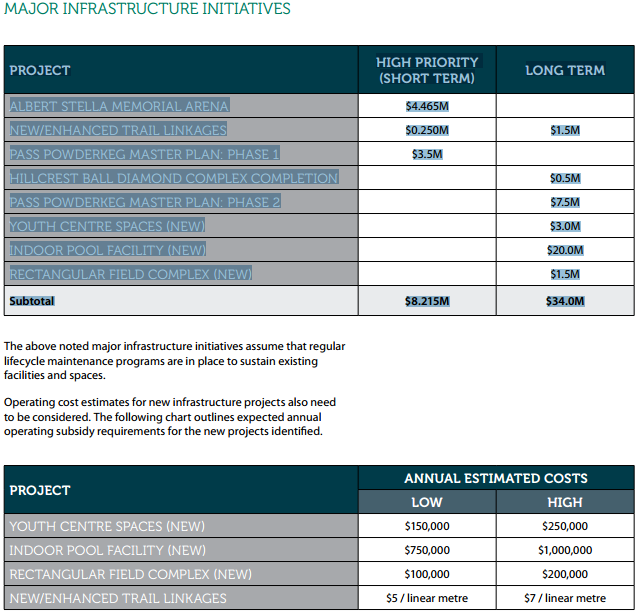 Ongoing life cycle investment in the facility is suggested, as per the 2011 assessment report. » Continue to provide the facility for community use and reinvest in it to sustain existing service levels as outlined in the 2011 assessment report. » When determining the feasibility of reinvesting in or replacing the Albert Stella, consider relocated some/all of the activities to the MDM Centre (or other alternative locations) if possible. » Attain capital and operational cost estimates for the development of Phase 2 as defined in the 2012 Master Plan. » Once these estimates are defined, prioritize Phase 2 development in relation to other potential projects as per the prioritization model provided in latter sections of this report. » Target provision of one rectangular field and one ball diamond in each Pass neighborhood. » Focus on full build out of the Hillcrest Ball diamond complex. » Look to develop a centralize site for rectangular field league and tournament play somewhere in the municipality. » Continue to support volunteer trail groups in the operation of existing trails and in their upgrading and expansion ambitions. Included in this is coordinating the formation of a Trails Advisory Group, potentially as a sub-committee of the Sport and Recreation Committee. » Extend the Community Trail west to ultimately connect to the Allison-Chinook Trails. » Ensure the mountain bike trails near Powder Keg Ski Hill are connected into the community trail system. » Develop and implement standards for trail development and maintenance (e.g. width, surface types, winter maintenance). Where necessary, improve the standard of existing trails to meet the proposed standard. » Investigate options for developing additional loop trails within communities to complement the linear Community Trail. Local residents will enjoy the option of walking/biking around their community as well as connecting to adjacent communities. » Maintain the current Non-motorized by-law within Municipality. Past experience with motorized use in Crowsnest Pass (and other Alberta towns) has shown neighbourhood conflicts where motorized use is permitted in urbanized areas. » Consider preparing a long term Trails Master Plan to provide direction on community trails, including linkages to regional trails. » Actively participate in access management planning for regional trails, as recommended by the Government of Alberta in the South Saskatchewan Regional Plan. » Continue to support development and operation of trailheads and staging areas located within the municipality. Formalize trailhead locations for popular hiking trails. » Lead promotion of trails as a major tourism attraction in the Region. » Promote formation of a Regional Trails Advisory Committee to work closely with adjacent municipalities; provincial agencies and volunteer groups on future trail development and management. » Maintain and invest in existing parks, open spaces and facilities where appropriate to sustain existing service levels. » Consider relocating some of the activities in the Albert Stella should the facility be closed for any period of time. » Promote all recreation amenities, including private sector fitness facilities, when presenting recreation opportunities to residents and visitors. The MUNICIPAL GOVERNMENT ACT has transparency requirements, including open meetings and conflict of interest rules. Councillors must abstain if they have a pecuniary (monetary) interest as explained in this Municipal Affairs brochure. It is not enough to just say "conflict of interest" or "perceived conflict of interest", Councillors must DISCLOSE the nature of their interest (eg., "I work for the company" or "My wife owns the adjacent land"). Some Councillors have abstained without valid reason, so they are disqualified from office. The Mayor's "possible perceived conflict of interest" does not tell us whether or not he actually has a pecuniary interest. Budget Meetings not advertised on website. "The numbers you are talking about are part of the budget process, they are being made public every Thursday between 2-5pm as we work through that process. These meeting are open to anybody that wishes to attend. I would expect that once the budget process is over there will be all kinds of information coming out." I might be interested in attending budget meetings discussing recreational facilities or economic development, but not sewage treatment. But I have no way of knowing what is on the agenda for each meeting. Councillors have the agendas but they are not made public and the meetings are not advertised on the website. The previous council also told us it was our fault we were ignorant because we did not attend the unadvertised "Policy Committee" meetings. Someone has distributed documents relating to the Smoke Eaters and Jamie Margetak Lawsuits, including letters from law firms to the municipality and the Smoke Eaters lease (with 90 day notice clause) on the Blairmore Fire Hall. This person wants the lawsuits dropped and the municipality to conduct an investigation (which Council voted to stop on Feb. 4, 2014). More info at "Truth Be Known CNP" (link no longer works). In the November 25 Council minutes, after "in Camera" they moved to "advise volunteers that Council wished to proceed to plan a fireworks and summer event for 2015" (no mention of who the "volunteers" are). This would require some funding, but there was no "budget impact statement". Council Minutes: Different rules for CNP vs. Calgary? 14. Administration refrains from posting unofficial minutes on the municipal website. All minutes must be adopted by Council before posting. 15. Administration discontinues the practice of recording votes on motions as unanimously carried or carried. All motions should be recorded as carried or defeated. However, I notice that Calgary posts unconfirmed minutes (in a timely manner) and their minutes record opposed votes (regardless of whether there is a recorded vote). Council decisions are preceded by a motion and the vote on the motion is recorded in the minutes. The expectation of a council is that there is debate on motions and that there will be motions that are not supported by all councillors. However, once the motion has been voted on the expectation is that all councillors will support the decision made by council. We identified an issue in the notes, specifically in recording the difference between motions that are “carried unanimously” versus a motion that is noted as “carried”. When recording the difference between motions carried unanimously versus a motion that was not unanimous, it demonstrates the cases where Council was split on a motion. This provides a clear signal of when all Councillors are in agreement and potentially could create a perception of the Municipality that if a motion is not carried unanimously then it is not as important as one that is carried unanimously. 2.6 If Council elects to sell the lands or improvements, the Chief Administrative Officer, or designate, shall have an appraisal done on the subject property to assist in establishing the fair market value price. 2.8 A notice will be placed in the local newspaper(s) for two consecutive weeks advising of the intended sale of the property. Have you seen any notices? I think the appraisals are public information according to FOIP. There should also be an appraisal on the land being given to Chinook to settle the lawsuit.